Christian Writer/Reader Connection: I've Been Tagged! Jessica over at BookingIt tagged me. Below are the rules. 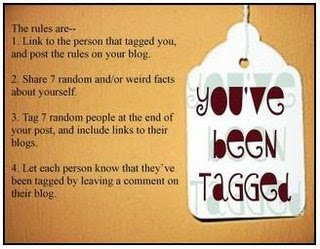 Since all of you already know a ton of weird or interesting facts about me, I'm a bit hard pressed to come up with seven. I'll give it a shot. 1. Some of the first Christian novels I read were by authors Eugenia Price and Catherine Marshall. I loved the book, "Christy," and still have a copy on my bookshelf. 2. Don't throw anything at me, but I can't stand Jane Austen's books. They're not my taste at all. 3. I enjoyed Gone With the Wind, but found the end disappointing. 4. If I go into a Christian bookstore, 9 times out of 10, I'll purchase a book. Most times I'll buy more than 1 if I have a coupon. So, I try to avoid entering unless I'm prepared to make a purchase. Sigh. What can I tell you? I love to read. 5. My dream Christmas gift? A gift card to Amazon.com. 6. I love taking pictures of special occasions. My only problem is it takes me forever to get the film developed. By the time I see the pictures, it's a huge surprise. Since Costco's processing is fairly inexpensive, I always get a double set of prints. This allows me to share them with the subjects. 7. Travel is another delight, especially in the U.S. This country is so beautiful. My late husband and I took a trip to Colorado back in 2004. The sites defy description. My favorite part of the trip was visiting Garden of the Gods. It's a park with stunning rock formations. I won't tag anyone in particular. Feel free to jump on the bandwagon and have a little fun. Hey, Susan! This is Kristy (formerly Simpson). I was at Garden of the Gods once, too. It truly is spectacular. I'm so glad we reconnected on Facebook! Congratulations on your marriage. My late husband and I had a wonderful time in Colorado back in 2004. In addition to the Garden of the Gods, we took a ride through the Rockies, and checked out Denver. Thanks for stopping by. I post here on Monday, Wednesday, and Friday. I love Colorado. Basically any western states. Funny about buying a book in the store. I don't go in either because I know I can't buy anything and it's too depressing. Don't worry. I've never read Jane Austen either. I had to read Jane Austen in school. Ugh. I'll pass. For the same reason I stay out of the bookstore, I stay out of the mall. Stores are designed to sell their merchandise. I'm thankful my Christmas shopping is done. While everyone is out fighting the crowds and overspending, I can write.